Robotic welding is the use of mechanized, programmable tools (or robots), which, when applied to welding, automates the welding process by performing the weld while handling the part. In terms of robotic usage, robot welding is relatively new, even though robots were first introduced into US industry during the 1960s. Using robots for spot welding in the automotive industry propelled robotic welding into mainstream usage. Robotic welding is both safe and efficient and has many applications. Fort Miller FAB3 in Schuylerville, NY, offers robotic welding in any metal fabrication process and in welding. While robots are amazing tools humans have developed to help us gain economies of scale in manufacturing and a host of other processes, they are, after all, robots that must be programmed to tell them what to do. Hence, robotic welding is only as good as the person programming the robotic welder. Robotic welding is only limited by the person behind the machine. Hence, if you want to increase the usage of robotic welding, you need to increase your skill. 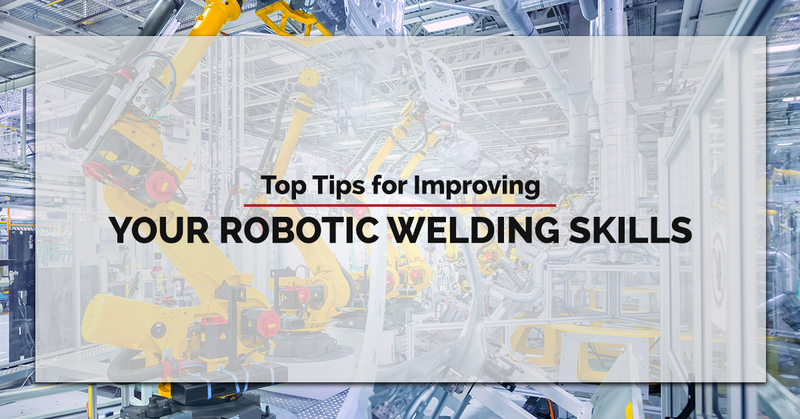 Below are tips to increase your robotic welding skills. Practice and training. In order to get better at any skill, you need to practice, be it playing the piano or basketball. Take advantage of every opportunity offered to learn more and practice robotic welding. With the internet, there are online webinars, videos, and even classes you can take in robotic welding. Most robot manufacturers and welding companies offer training in different aspects of robotic welding such as maintenance, troubleshooting, and operation. Communication. Robots speak a different language, and it’s imperative to learn their language in order to get the results you are seeking. This is especially important when integrating an industrial robot into a robotic welding cell. Efficiency. The robot is designed to do the same process over and over again in the same manner and in the same way, so errors are eliminated. However, it doesn’t “know” how to do this; it has to be told. In the same vein as communication, the person behind the robotic welding has to be good at problem solving, so when the robotic welder spits out an inferior product, the robotic welder can spot the error and program the robot how to fix it with little trial and error. Knowing how to ensure repeatability is key to a good robotic welder. Monitoring. In the same vein as efficiency, monitoring the robotic welder and what it produces is key to keeping customers happy with the product. Depending on the robot, the panel can be quite complicated, and knowing what the robot is “telling” you will improve processes, improve what you can make, and improve your overall skills with robotic welding. Troubleshooting, maintenance, and breakdowns. One invaluable skill you can have and/or improve in robotic welding is the ability to troubleshoot when your robot decides to take an unscheduled break from its work. As we all know, shutdowns cost everyone money, so being able to get your robot up and running as soon as possible is important. Make sure you know how to run a regular maintenance schedule with your robotic welder as well to help prevent breakdowns. Safety training. Knowing what you can and can’t do around a robotic welder as well as where you can and can’t go is key to keeping not only you safe, but also everyone in the factory safe. Also, be cognizant of your surroundings and your environment. Welders produce fumes, demanding a good ventilation system. Multiple and varied tasks. Your robotic welder is a powerful machine, capable of doing multiple tasks at the same time as well as working almost non-stop. Harnessing the power of your robotic welder as the operator will yield huge dividends and paychecks as more tasks are done, producing more products, which results in more sales. Robotic welding is only projected to grow in the future, fueled in part by the demand that robots can fulfill (more efficient, more consistent weld quality, and/or to reduce costs) but also fueled by the lack of high-quality welders. Materials are getting more sophisticated (as shown by the growth in alloy usage), and customers now expect welds that are free of spatter, a cleaner cut, and that are more uniform. Robotic welders and robot programmers have a higher technical capability job and a wider path for growth. Growth in robotic welding is primarily limited by high equipment costs, and the resulting restriction to high-production applications. However, robotic welding increases productivity, quality, and ROI (return on investment), making robotic welding an attractive alternative for both small and large businesses alike. Fort Miller FAB3 in Schuylerville, NY, offers robotic welding for a high volume of different-sized metals, quickly, efficiently, and precisely. As a Top Rated Local® fabrication company, Fort Miller FAB3 provides excellence in all that we do as we ensure consistency beyond your expectations. We invest in training our robotic welders to be the best they can be. We are constantly innovating and pushing the envelope to develop new techniques and new applications for our robotic welding processes. From the most minute detailed aluminum cutting job to the biggest pieces of equipment for commercial applications, Fort Miller FAB3 can handle any robotic welding and custom fabrication job. Through robotic welding, key personnel can now perform more difficult operations, leaving the repetitive tasks to the robots. If you have a metal fabrication job and need robotic welding services, contact Fort Miller FAB3 today!